PM Netanyahu, Pres. Rivlin, and MKs slam Poland for new bill to jail those who mention Poland's role in the Holocaust. Israeli Prime Minister Binyamin Netanyahu on Saturday evening responded to Poland's bill to outlaw mention of Poland's role in the Holocaust. According to the bill, those who mention "Polish death camps" or blame Poland for murdering Jews would face up to three years in prison. The law would also apply to those outside Poland. 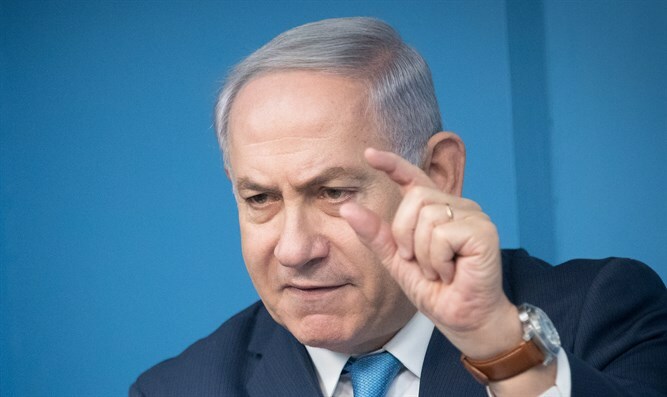 "The law is baseless; I strongly oppose it," Netanyahu said. "One cannot change history and the Holocaust cannot be denied." "I have instructed the Israeli Ambassador to Poland to meet with the Polish Prime Minister this evening and express to him my strong position against the law." In a statement Israeli President Reuven Rivlin responded, "'One cannot fake history, one cannot rewrite it, one cannot hide the truth. Every crime, every offence must be condemned, denounced, must be examined and exposed.' This was stated in the Knesset by former Polish President Aleksander Kwaśniewski." "Only 73 years have passed since the gates of hell were flung open. Living Holocaust survivors are disappearing from the world and we still have to fight for the memory of the Holocaust as it was. "The Jewish people, the State of Israel, and the entire world must ensure that the Holocaust is recognized for its horrors and atrocities. "Also among the Polish people there were those who aided the Nazis in their crimes. Every crime, every offense, must be condemned. They must be examined and revealed. There were also others among them who fought and were recognized as Righteous Among the Nations. "On International Holocaust Remembrance Day, more than ever, and above all considerations, we are faced with our duty to remember our murdered brothers and sisters." Public Security Minister Gilad Erdan (Likud) said the law is "horrific and terrible - it will harm our ability to educate against hatred and racism." "You cannot deny the role many Poles played in the Holocaust, and the aid they provided to the Nazis and their murderous activities," he said. "I call on the Polish government to act immediately to cancel this shameful law." "No law can change the historical truth, and it is unacceptable to try to 'educate' the families of Holocaust survivors, who live every day with the memory of loved ones who were murdered in hell." Earlier on Saturday, MK Yair Lapid (Yesh Atid) tweeted in English, "I utterly condemn the new Polish law which tries to deny Polish complicity in the Holocaust. It was conceived in Germany but hundreds of thousands of Jews were murdered without ever meeting a German soldier. There were Polish death camps and no law can ever change that." In a Hebrew tweet, Lapid wrote, "No law can change history. Poland was a partner to the Holocaust. Hundreds of thousands of Jews were murdered on its land, without a single German officer present." In October, Poland’s culture minister criticized an exhibit at the House of European History in Brussels for "showing Poland, France and Ukraine as co-perpetrators of the Holocaust, and the Germans as a country which cultivates memory of the Holocaust." Warsaw monitors global media closely for descriptions of such camps as "Polish," having also censured British and US media in the past. Poland claims that the camps were built on Polish soil after the Nazis conquered the country and therefore the term should be "Death camps built in Poland." However, Poland ignores the complicity of many its citizens, their looting of Jewish property and murders perpetrated by Poles such as the 1941 Jedwabne massacre and the 1946 Kielce pogrom against Jews returning from the camps.